So, I’m just a little bit behind on sharing projects from late 2018. Moving forward I’ll be intermixing newer projects with older project until I get through the backlog. Today, back to school outfits! 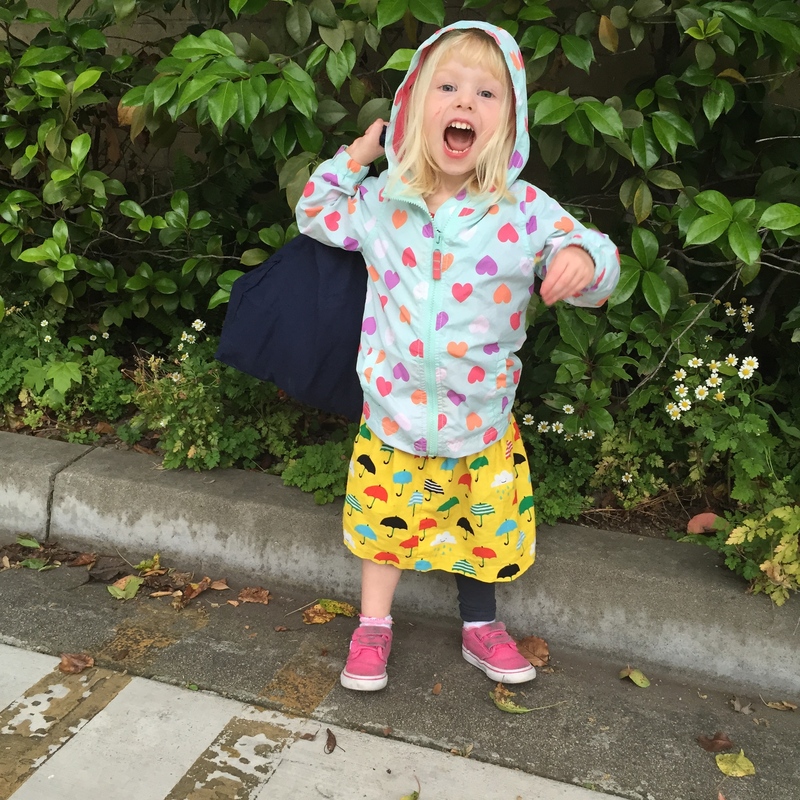 Both of my children wear a uniform for school, but the dress code is not terribly strict. As long as their shirt has a collar and the colors are correct-ish neither school will complain. I usually buy most of their school clothes as polo dresses and leggings as both cheap and easy to acquire, but the first day of school is special and deserves something fun to wear! For Charlie I went with separates. This is the Oliver + S Music Class pattern. It’s a great little uniform pattern with a classic blouse and simple skirt. Great for wearing to school and pretty easy to sew as well. 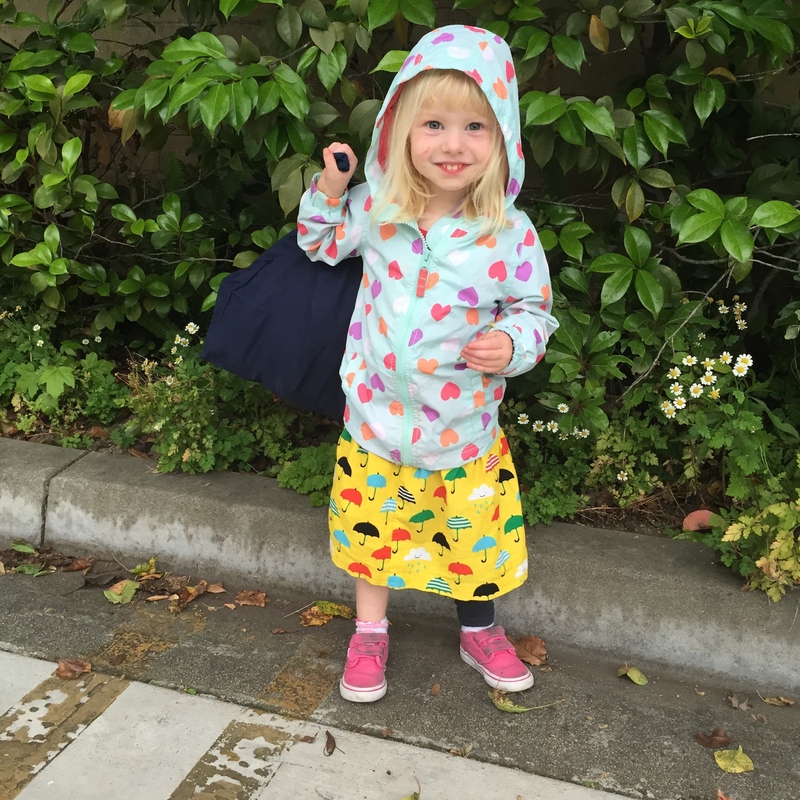 Back when Lu went to preschool I bought all kinds of uniform fabric. I was definitely going to make all her uniforms. Ha! Nope. I had a Charlie a few months into Lu’s preschool years and that fabric has mostly sat in my stash. This fall I used most of the uniform stash to actually make more school uniforms including this adorable back to school outfit. Charlie likes it pretty well, especially those cat buttons. Charlie is very obsessed with cats, even though we don’t own one. When I saw these buttons at the Costume College marketplace, I just knew they would bring a smile to Charlie’s face…and they did! The fabrics are both from Robert Kaufman, but after 3+ years my memory of the specifics is gone. 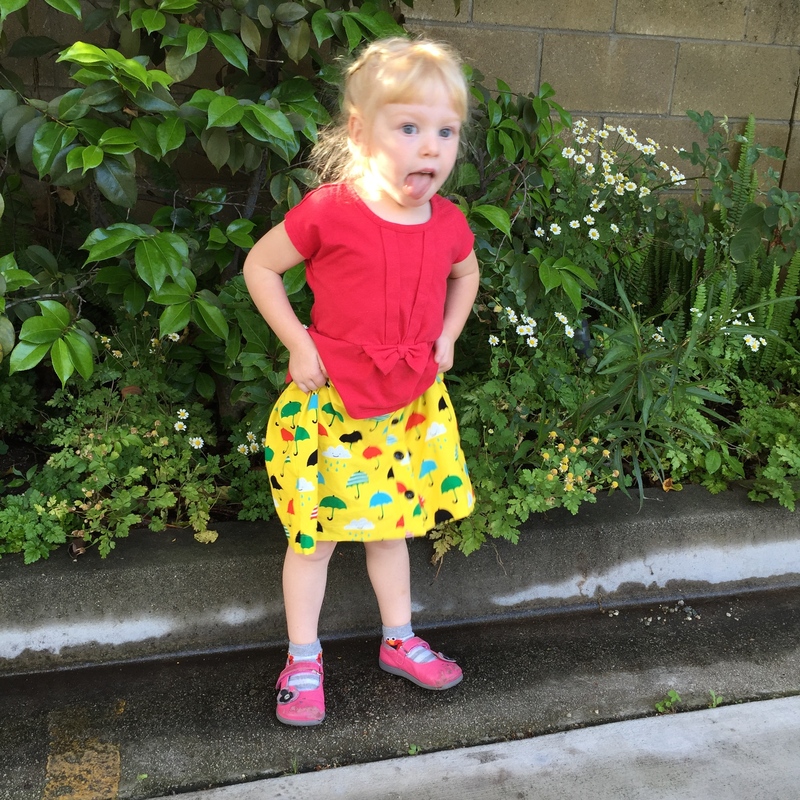 I’m sure the shirt is lawn, but the skirt is…? Who knows. Something sturdy that took the pleats really well. This little girl is not real fond of school, but wearing pretty clothes makes her happy and that makes momma happy too. 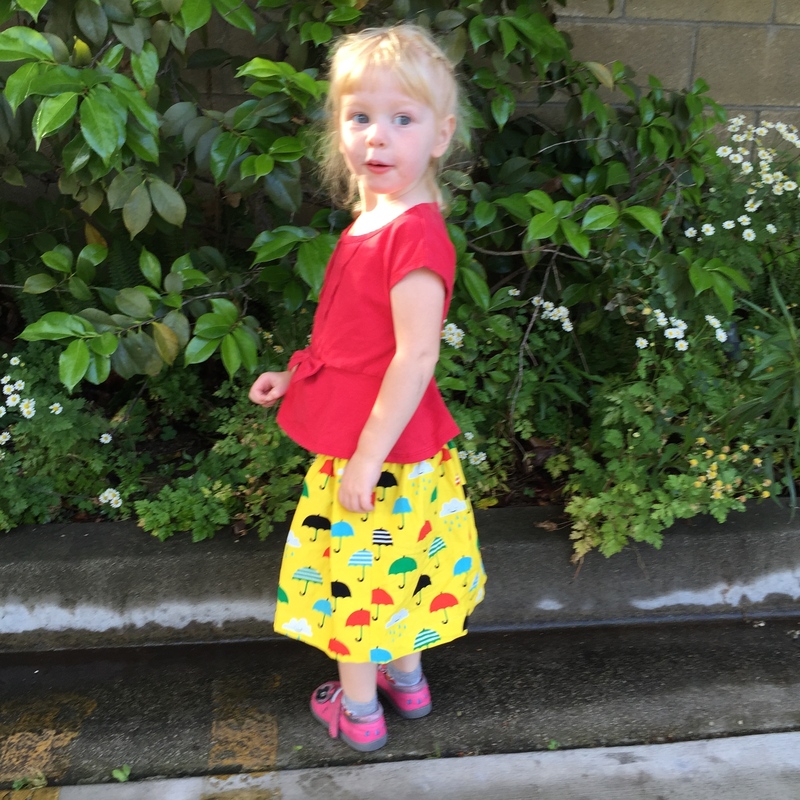 For Lu’s first day of first grade, I used a vintage pattern. I went on a little vintage pattern ebay spree over the summer and this little number called my name as something cute, uniform-ish, and practical. It’s Hollywood Pattern of Youth #1504. I could not find it on any of the vintage pattern cataloging sites and was a bit hard to date, but I’d guess its from the 1930s. The starlet for this pattern is Virginia Weidler who was born right now the road from us and it best known from The Philadelphia Story and The Women. Lu was a total ham in this dress. I think she liked it quite a lot, but she really loved those shoes! Too bad they broke on the third wearing and had to be returned 😦 The belt was also a huge hit. I had no idea such an accessory could bring so much joy to a child. The fabric was nothing fancy. My stash was all really stiff skirting fabrics and so I journeyed to JoAnn’s to find something with a touch more drape. I returned with a rayon blend twill and some white rick rack. The twill was also a bit too stiff for the pattern, but I didn’t want something too delicate. Neither of their first day of school outfits has made it into heavy rotation. Those polo dresses really so just so much easier to maintain and comfy to wear. That’s okay though. Special clothes don’t have to be worn all the time. Making them brought all of us such joy. They have served their purpose. My older daughter Lu turned 4 years old last week! Hard to believe these past 4 years have gone my so quickly, but here she is all tall and gangly and full of opinions. And of course the birthday girl needed a new dress! I’d had my eye on this fabric from Sarah Jane for about 2 years, but this was the first time I really saw it becoming a dress. Oh yes, a Fairy Tale Dress from Oliver + S. So classic! And perfect to use with a border print. Then I topped it all off with some sweet pink voile and tulle I found at my local quilt shop. What girly girl has resist a poofy skirt? My husband is so good at making bows! Clearly the birthday girl loved it. But I couldn’t only make something for Lu. 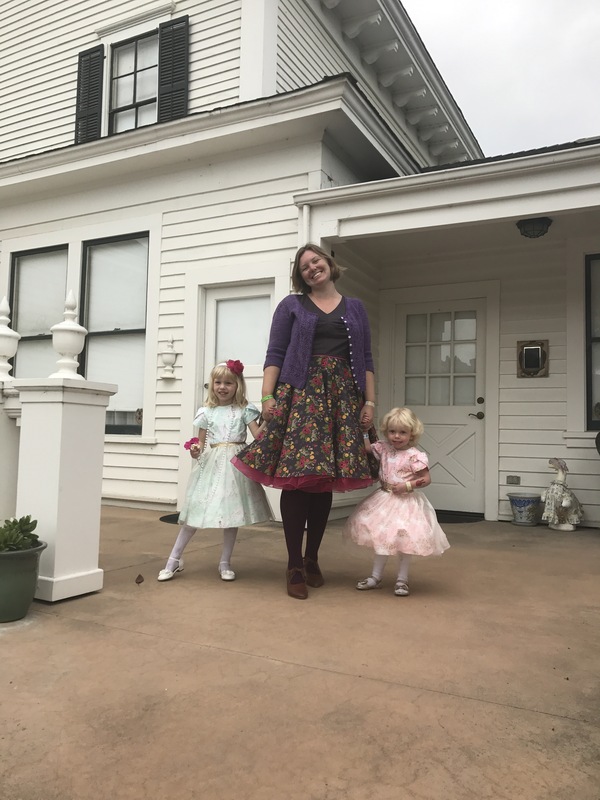 A few days before the party I decided to make the little one her own spring dress! This is the trusty Geranium Dress pattern. At this point I can make one from printing the pattern to sewing on buttons in about a hour. I just don’t get sick of this pattern. And I had some sweet little vintage duck buttons that work perfectly with Ann Kelle’s cute fabrics. So pleased to be able to make something springy for the girls! Next up, Easter Dresses! I’ll admit it. When I bought this fabric I bought it because I loved it. I had no idea Lu would latch onto it so firmly. 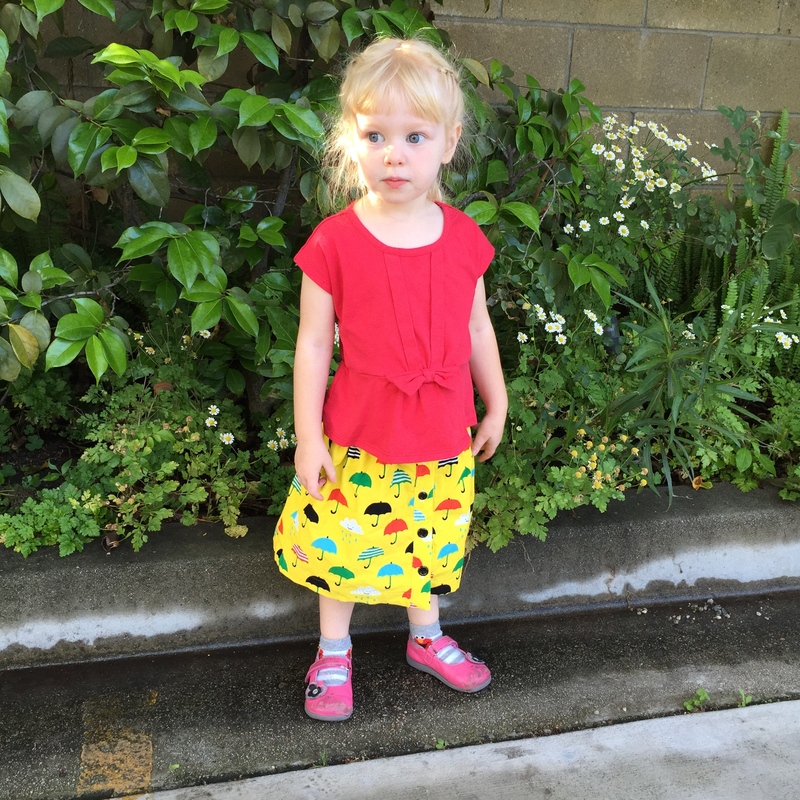 I also had no idea she’d suddenly start asking to wear a skirt every day. But this is easily the item of clothing she requests most often. Easily. It’s a tad on the large side. Lu is hard to fit in that she is average height, but quite slim, so I made a size 2T with 3T length and cut the elastic to be 2 inches smaller than the pattern recommended. It’s still too big. But that doesn’t stop Lu from picking it first every single time I do laundry. Sadly she wears uniforms Monday-Thursday, but come free dress Friday… only umbrellas will do. 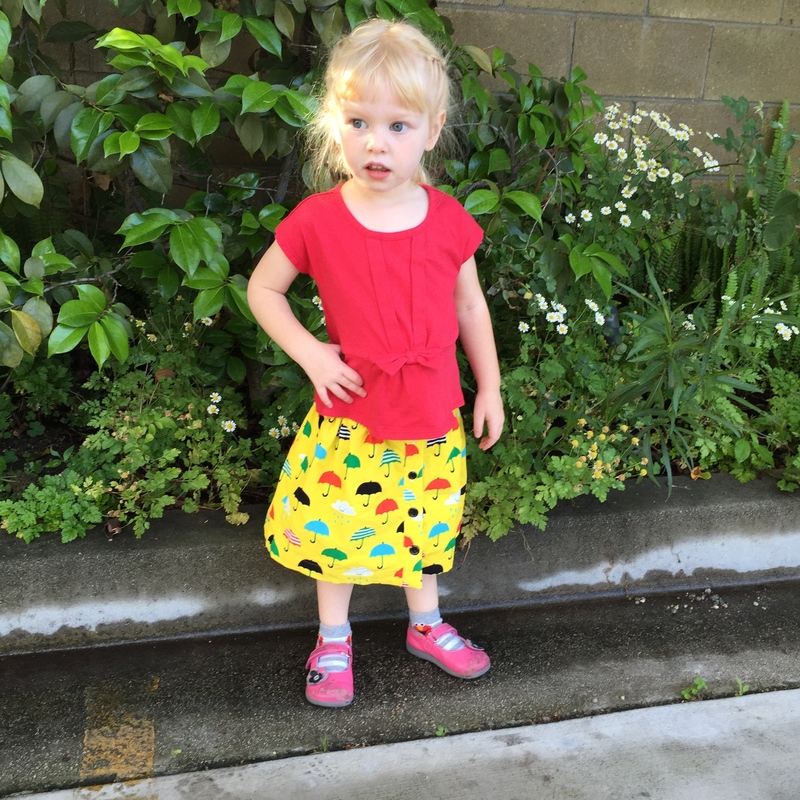 I am preschooler and I will wear what I want!